Erosion of the Australian Alps over the last ten million years has formed many mineral sands deposits in the Murray Basin, along the beaches of the East Coast and in the Gippsland Basin. As the Alps (which would have stood another kilometre taller) eroded, the mineral grains were carried down rivers to the ocean’s edge where they settled. Wind and wave action further concentrated the minerals to form the deposits that are mined today. When you are next on a beach, you may see concentrations of black sand and chances are you are witnessing this geological process in action on a small scale. The most famous recent mineral sands province formed from the Australian Alps was the Murray Basin, where four deposits have been mined in Victoria since the mid 2000’s. The Australian mineral sands industry started almost 100 years ago on the beaches of the East Coast. Since then, most beaches from Newcastle to Brisbane have been mined for mineral sands, including Byron Bay and Surfer’s Paradise. The Glenaladale deposit was discovered in 2004 by Rio Tinto and is the first significant mineral sands discovery made in Gippsland. Rio Tinto carried out extensive geological, metallurgical and feasibility studies until it was acquired by Kalbar in 2013. The Glenaladale deposit is a sequence of around 30 mineralised layers extending over around 15km from Stockdale to Glenaladale. In the Northern areas the deposit is at the surface, and dips at about 1 degree to the South. The layers appear to have formed due to pooling in a lagoon or an off-shore bar. The deposit is at least 70m thick! A remarkable thickness for a mineral sands deposit, but it may be thicker as 70m is the maximum depth of our drilling. Within the 70m of mineralisation are layers of extremely high grade mineral sands that have formed where massive storm action (1,000 year storms) have stirred up the lagoon and caused all the heavy minerals to settle in a very rich layer of valuable mineral. The layer with the highest grade and which is closest to the surface is called the Marker Horizon, and it is the key economic driver of the Fingerboards mine. The Marker Horizon is the key discovery of Kalbar geologists, and has made the Fingerboards Mine the most economic project in the world’s project pipeline. The Marker Horizon is rich in the most valuable mineral sands: zircon and rutile. The assemblage of the heavy mineral is 28% zircon, 11% rutile. At time of writing zircon was worth $1,600/t and rutile is worth $1,050/t. The assemblage of the Fingerboards Heavy Mineral is around 90% Valuable Heavy Mineral, making it ideal for concentrate exports. 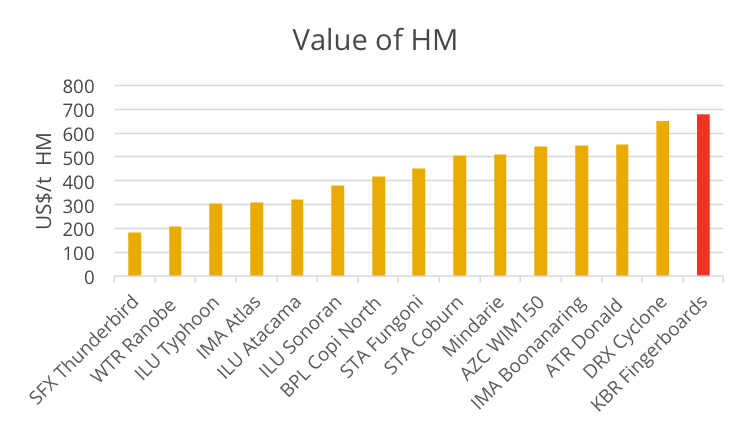 This chart compares the zircon projects in development in terms of the value of their heavy mineral (HM). Projects need to be towards the right side of the chart to cover the cost of shipping concentrate. 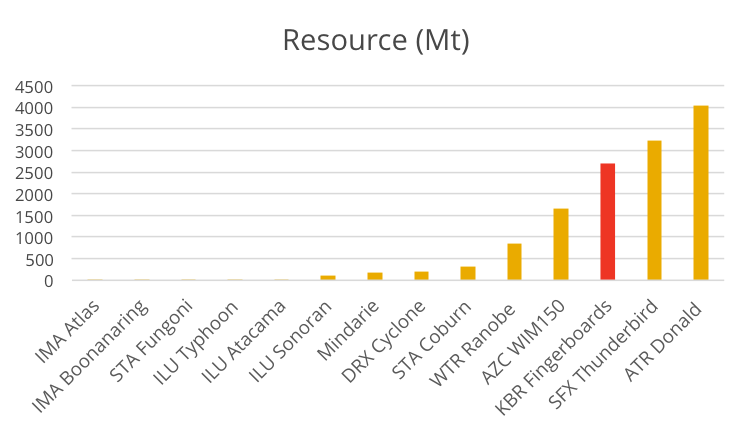 Kalbar’s exploration activity has increased the Glenaladale resource from 1.7Bt to 2.7Bt of heavy mineral, cementing its position as one of the largest mineral sands deposits in the world and the Fingerboards zone has some of the highest grades known.